"Transportation planners need better information about truck characteristics and commodity flows to make difficult decisions in selecting and prioritizing projects," said Sarah Hernandez, assistant professor of civil engineering in the College of Engineering at the University of Arkansas. "While there are sensor technologies that provide estimates of truck volumes, these systems are limited by poor pavement conditions and don't provide the level of detail needed for effective planning. Our non-intrusive system is capable of more complex data collection and is not affected by adverse road conditions." 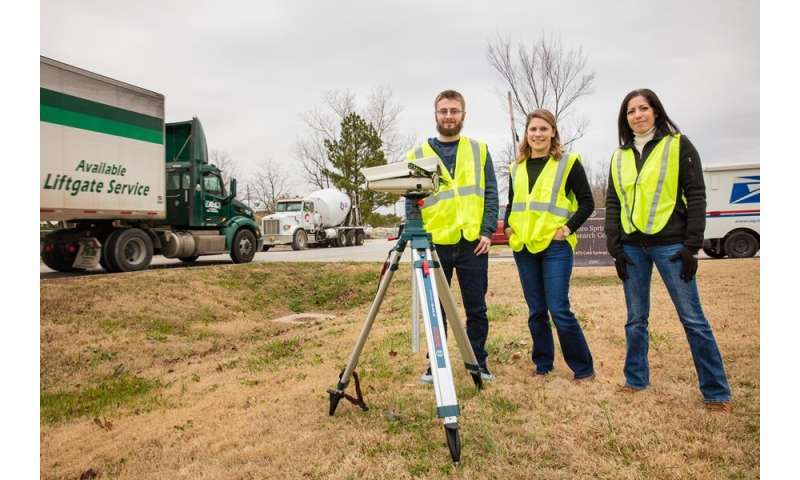 Hernandez; Magdalena Asborno, a doctoral student and graduate research assistant in civil engineering; and Collin Burris, an undergraduate student in computer science and computer engineering, used inexpensive, single-beam LIDAR sensors deployed along busy highway sites in Arkansas to gather information about the quantity and types of tractor-trailers moving through those areas. Similar to radar, LIDAR uses pulsed, infrared laser light to detect distant objects and measure the distance to those objects. The sensors were mounted on tripod stands next to the highway and about four feet off the ground, so they could monitor several lanes of traffic and did not depend on road conditions for accuracy or reliability. Time-stamped measurements recorded by the LIDAR sensors allowed the researchers to generate "signatures," and matched these signatures to the shapes of individual vehicles. The prototype captured five distinct body types of tractor trailers with high accuracy rates, and the researchers are refining the system and expanding the data model to identify up to 50 unique types of trailer bodies. Knowledge of the body type provides information on the commodities transported through a region. For example, monitoring the movements of hoppers, the type of trucks that carry rice and soybeans – two crops critical to the state of Arkansas – could explain how and when farmers are transporting these commodities to market This, in turn, could help transportation planners decide the best methods to alleviate transportation bottlenecks that affect certain industries, such as agriculture. A system that provides knowledge of truck body type could also inform decisions on whether or when to expand highways or develop new routes and how to implement policies to promote a shift to rail or water, the latter involving strategically locating a port or other intermodal facilities. "Our goal is to work with very low-cost technology so we can achieve widescale deployment," Hernandez said. "For example, with a $1,000 sensor, the Arkansas Department of Transportation could deploy 100 sensors across the network, rather than using $10,000 sensors at only 10 locations. We get better coverage this way and thus better insight into truck movements." An article about the prototype was published in Transportation Research Record.